What are the top landmarks in Barcelona? Take a leisurely promenade along Las Ramblas to experience Barcelona life in all its colourful intensity. Buildings don’t come more iconic than this extraordinary basilica which has become the symbol of Barcelona worldwide. Catch an event at Camp Nou during your trip to Barcelona.Visit the shops and stunning cathedral in this vibrant area. This popular Barcelona meeting point connects the old city with the new and is famous for its shopping, monuments and festival celebrations. A surprise awaits you at every turn in this fantasmagorical park with fabulous views over the city. Nothing says holiday like spending a lazy day at Barceloneta Beach, a popular beach in Barcelona. Amble around this vibrant area's waterfront or experience its fascinating museums. Gothic Quarter is a welcoming neighbourhood with many tasty options for cafes and restaurants. The neighbourhood has many charming qualities, with its architecture among the more noteworthy. For a taste of local culture, you can visit the cathedral and shopping. The Eixample neighbourhood welcomes visitors, with its convenient options for restaurants. The neighbourhood’s charm comes through in its architecture. You can satisfy your cultural palate with art scene and cathedral. La Sagrada Familia is a welcoming neighbourhood. The neighbourhood’s architecture and friendly people are just a couple of its charming qualities. Broaden your horizons with some local cathedral. 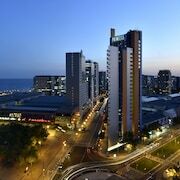 The Barceloneta neighbourhood welcomes visitors, with its convenient options for restaurants. The neighbourhood has many charming qualities, with its architecture among the more noteworthy. Many visitors come to enjoy the natural beauty of the beaches. Ciutat Vella is a neighbourhood that welcomes all visitors. The neighbourhood has many charming qualities, with its architecture among the more noteworthy. You can satisfy your cultural palate with cathedral and art scene. La Ribera is a welcoming neighbourhood with many tasty options for cafes and restaurants. In addition to its architecture, the neighbourhood has many charming qualities. You can satisfy your cultural palate with museums and shopping. Best destination for 2016: Costa Brava. Opens in a new window. 2 unique ways to explore Barcelona. Opens in a new window. Big adventure in Costa Brava. Opens in a new window. Glorious Gaudi, in Barcelona. Opens in a new window. 48 hours in Barcelona. Opens in a new window. Good value Hotel. Close to the Metro station and tour buses. Staff was friendly. Great Cappuccinos at the Coffe shop. Friendly staff. Very clean. Wonderful food. Shuttle service great. With its inspiring architecture, vibrant culinary scene, and an ever-growing list of attractions and amenities, it's no surprise Barcelona is a popular holiday destination. Whether you spend your day admiring the stunning architecture of the Basílica de la Sagrada Familia, catch a football game, or eat your way through the fine cuisine of this Spanish city, Barcelona is a unique and colourful destination. 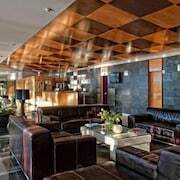 Your next adventure in Barcelona, Spain starts right here on Expedia.co.in when you book your holiday package today. 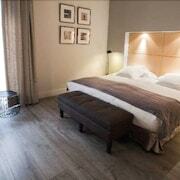 Barcelona accommodation spans across all budgets and styles, from inexpensive apartments to 5-star luxury resorts. 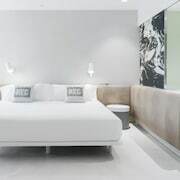 Whether want to book a family holiday in a hotel by the sea or take off with friends for a designer hotel, you can find a room to suit your needs. Browsing is easy with our Expedia.co.in hotel search engine to narrow down hotels based upon location, nightly rate, and amenities. 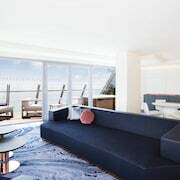 Whether you’re interested in Barcelona hotels with a view or Barcelona boutique hotels, Expedia.co.in offers the lowest prices on even the most sophisticated suites. The most efficient way to arrive in Barcelona is by air via the Barcelona-El Prat International Airport (BCN). After landing, there are several ways to get to hotels in Barcelona. The Aerobus city shuttle service and train can both deliver you to most neighbourhoods throughout Barcelona. Taxi service is readily available, or you can get a car hire right here on Expedia.co.in to give you the liberty to travel at your own pace.Many attractions are relatively close together, making walking another popular mode of transit in Barcelona. 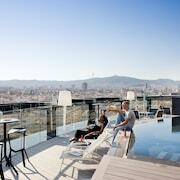 Unleash Your Holiday – Book a Barcelona Holiday Package Today! As the largest and most trusted online travel agent, Expedia.co.in is dedicated to providing the lowest rates on the best Barcelona hotels. Whether you want to stay in a cost-effective econoIN hotel or sprawling luxury resort, Expedia.co.in offers exclusive deals and specials. Your holiday in Barcelona starts right here. It won't take long before you run into an example of what sets Barcelona apart. The Modernist movement (Art Nouveau's Iberian manifestation) takes its most spectacular form in the city's fantastic architectural creations, most famously Antonio Gaudi's Sagrada Familia, the gothic cathedral which has been under construction since 1882. Bike it or bus it around to discover the urban tableau. Or, head to Parc Güell for an original and interesting park that offers more than just green space. The painter Joan Miró another Barcelona native. The Miro Foundation holds the largest collection of his work anywhere. The famed Picasso Museum is also a must, as is the Dalí Museum in nearby Figueres. Take a walk down Las Ramblas, Barcelona's tree-lined thoroughfare, and spend some time with the unique human statues, a surreal form of living art. Regional differences in Spain are pronounced and Barcelona is fiercely proud of its Catalonian roots. Manifested most obviously by language, the Catalonian identity has a long history that can be traced back to the ninth century. Banned under Franco, the Catalan language now flourishes, and has undergone an astounding resurgence in recent years. This independent spirit infuses the city with life. From tall castellars (human towers) at festivals to fusion cuisine to rival Paris or New York, Barcelona is a creative and vibrant metropolis with one eye on the Mediterranean and the other looking toward the hills (try the funicular up to Tibidabo hill). Barcelona comes to life after the sun goes down. The Barri Gótic is Barcelona's oldest section, but it's also home to some of the trendiest bars. Mix with the locals in the La Raval neighborhood, eat tapas at sunset, and go clubbing until dawn. It's all on the agenda in a city where midnight is just the start of the evening. Your Barcelona city tour can take you to bullfights in the Gothic Quarter, to Europe's biggest football stadium, or to a flamenco show. Come in June for the Sonar Festival and experience electronic music beyond measure. Since hosting the 1992 Olympics, Barcelona has seen revitalization that has never slowed. It's a vibrant mix with new hip addresses and old markets with fresh produce. Its depth and complexity befit the capital of Catalonia and at the break of dawn, it may feel like the capital of the world. Explore Barcelona with Expedia's Travel Guides to find the best flights, cars, holiday packages and tips for your trip!